Summary: If you are looking for the iCloud for Android, you may be disappointed for currently iCloud still only serves Apple users but not Android users. Luckily, there are always alternative ways to help you access iCloud on Android, transfer data from iCloud to Android and etc. Please read on to get more information. iCloud, as Apple's own unique cloud service for closed iOS system, allows users to store 5GB data for free. And users of iPhone, iPad or iPod touch can store and access music, photos, apps, calendars, documents and more on iCloud. However, iCloud has no android version. iCloud is developed by Apple while Android is developed by Google, and they are competitors to each other, iCloud won't work with Android phone or tablet somehow. However, Where there is a demand, there is a method. 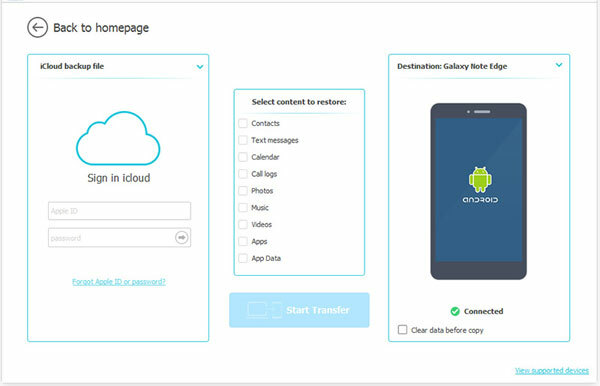 With this tutorial, you can easily visit iClouc.com on Android phone, access iCloud photos, iCloud contacts and more from Android phone, check iCloud email on Android phone, transfer iCloud data to Android phone or tablet. If you have tried to browse icloud.com on Android phone, you might have found that it is blocked on Google. However, sometimes it is needed urgently to access iCloud.com on an Android phone. For example, you have lost your iPhone and now all you can use is an Android phone, how do you use iCloud's "Find My iPhone" feature to track your lost iPhone on an Android device? This part will help you a lot in this case if it really happens. Please follow these steps. Step 1. On your Android phone, please visit www.icloud.com on Google Chrome browser. Then you might see the following screen telling you that "Your browser is not currently supported." Step 2. At the top-right corner of the screen, please tap the More option (three-dot icon) to view more options. 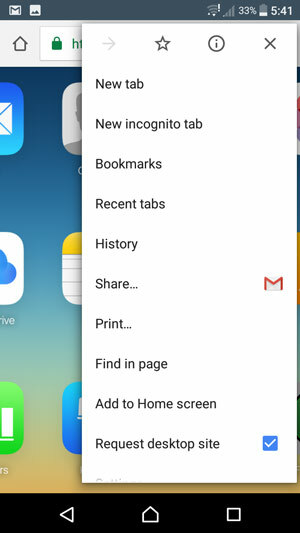 Select "Request desktop site" option to have your Android phone switch to visit the desktop version of iCloud.com. Thus you will be able to open iCloud's official website on Android phone or tablet. Step 3. 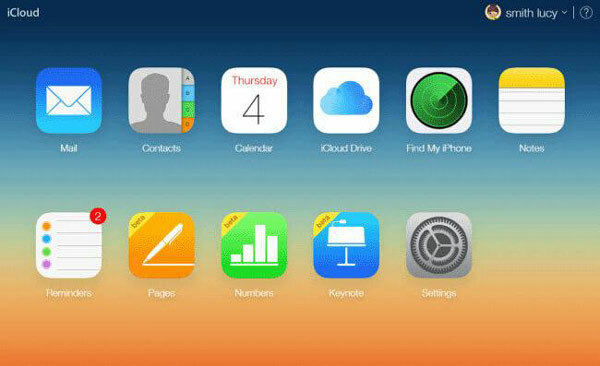 Then you might see iCloud's home page appears on the screen, simply sign in to iCloud with your Apple ID and password. 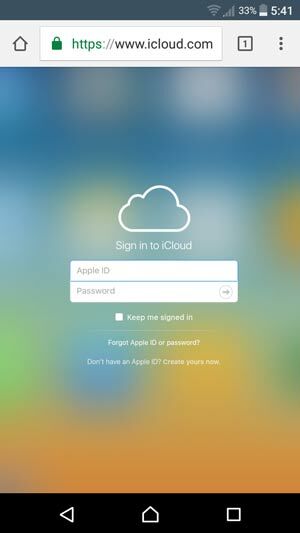 Extra tips: What Can You Do after Accessing iCloud.com? After logging into your iCloud account, you can access your iCloud backup files, such as iCloud mails, iCloud contacts, iCloud calendars, iCloud notes, iCloud reminders and more; and you can track your lost iPhone or iPad with Find My iPhone feature, also you can access iCloud Drive on your Android phone as well. How to view iCloud data on Android phone? To check iCloud files on Android phone, please log into your iCloud account with your information with the above steps. After that, simply choose the corresponding category to view emails, photos, contacts, calendars, notes, reminders and more on the home page of iCloud. How to track lost iPhone on Android with Find My iPhone? To track your lost iPhone, iPad on Android phone, please log into your iCloud account on Android phone or tablet with the above method. Make sure you have signed into the iCloud account that is connected to the iDevice you want to track. Then choose "Find My iPhone" option on the home page of iCloud where you can check your lost iDevice's last known location on a map (as shown in the figure below). Even if there is an Android version for iCloud, this iCloud for Android may be the same as iCloud for iOS, that is, you can sync Android to iCloud, view iCloud data on Android phone (as mentioned above) and also restore iCloud backup to Android phone. However, such iCloud for Android might have the same problem of the current iCloud for iOS, that is, restoring iCloud to Android phone will erase all existing data with the restored iCloud backup replaced. 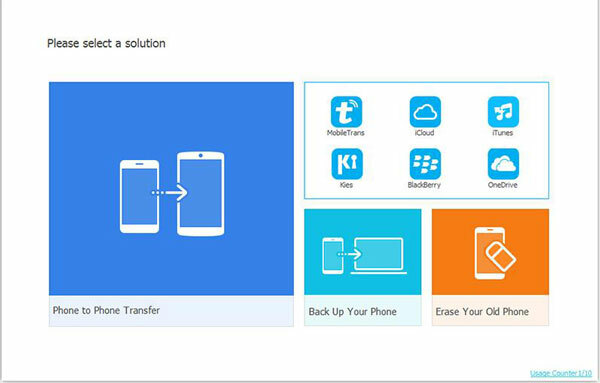 To solve this problem and also help users to restore iCloud backup to Android phone, the alternative to iCloud for Android - iCloud to Android Transfer (Windows/Mac) allows you to transfer everything from iCloud to Android phone or tablet without restrictions. You can selectively or wholly import iCloud photos, iCloud contacts, iCloud messages, iCloud calendars, iCloud call logs and more to Android phone with one click. Also, it is fully compatible with almost all Android phones or tablets, including but not limited to Samsung, HTC, Sony, LG, Motorola, Huawei, Xiaomi, OPPO, Meizu and more. Also the latest Samsung Galaxy S9 Plus and Galaxy S9 are supported. Free download the alternative to iCloud for Android on your computer and follow the tutorial below to transfer iCloud files to Android phone step by step. This tutorial helps you to export iCloud backup files to Android phone with alternative iCloud for Android software. Please make sure the iCloud backup contains the contents you need. Step 1. Make your device detected by the program. Install and launch the alternative to iCloud for Android program on your computer, and connect your Android device to computer via a USB cable, making the program recognize your device. After that, please choose "Restore from Backup" > "iCloud" options on the main interface to move on. Step 2. Sign into your iCloud account to access iCloud backup. On the next screen, please enter your Apple ID and password to log in to your iCloud account. Here please make sure the "Connected" notification appears under your Android phone on the screen, if not, please replug your Android device to reconnect it before signing into your iCloud account. Step 3. Select iCloud contents and move iCloud files to Android device. After signing into your iCloud account, please choose an iCloud backup that contains your required file from a list of iCloud backup files. Now, tick off the desired contents on the middle panel, such as contacts, messages, call logs, calendars and photos. After selection, simply click "Start Transfer" button to start to retrieve iCloud backup files to Android device right away. Note: During the restore process, please don't disconnect your Android device to computer. When the whole process is finished, you can disconnect your Android phone and manage restored iCloud backup files on your Android device freely.